Letter from Linus Pauling to Stanley Schaefer. March 19, 1953. Page 1 Larger Images / More Information. 1 p.
I have just finished reading your paper in the February "Proc. Nat. Acad. Sci." on a new type structure which you have proposed for nucleic acids. I have been interested in the biochemistry of the nucleic acids for some time and have recently constructed an hypothetical duplicating mechanism for peptide chain and nucleic acid synthesis which seems to be logically consistant and which makes use of reaction types that are familiar to the biochemist. However this mechanism requires functionally available phosphate groups as you will see if you care to glance through the enclosed reprint. Therefore a single nucleotide chain or helix would be required as postulated by Astbury and by Furberg, and if the three-chain helix postulated by you is correct, my mechanism must go into the waste basket. 1. Do the positions of the hydrogen atoms associated with the oxygens of the phosphate tetrahedra indicate that these hydrogens would be difficult to replace by metals such as sodium, potassium, calcium, barium, etc. ; by dye molecules (methyl green); and by basic proteins (histones or protamines); or for that matter by ordinary proteins? It would seem to me that in reactions involving replacement of the phosphate hydrogens by any of the above-mentioned substances (present in solution as cations), there might be difficulties if the cation replacing the hydrogen could not because of steric hinderance get close to the oxygens of the phosphate group bearing the negative charges. If such steric hinderance should be appreciably-present, then any hydrogen ions which were present should still be attracted into positions close to the negatively charged oxygen atoms, and it would seem to me that the net result would be to render the hydrogens very non-dissociable from the phosphate groups. In view of these considerations, can you make your model work properly in exchange reactions involving the hydrogens of the phosphate groups with other cations, and would it work as well as the Astbury or Furburg models? 2. How good is the evidence for the cross sectional area of the DNA molecule? Astbury makes a rough calculation of cross-sectional area based on estimates of the dimensions of a nucleotide molecule (15 X 7.5 Ǻ) = 112.5 Ǻ2. As far as I can see this assumes a ribbon-like molecule with or without coiling. If this value of Astbury for area is divided into 338 Ǻ3, your figure for the volume per nucleotide, obtained from the average residue molecular weight and the density, we obtain a figure of about 3.01 which is somewhere near the distance along the fiber length occupied by a repeating unit (3.4 Ǻ) as calculated from the x-ray measurements. This would indicate as I under- stand it that the observed spacing probably corresponds to the distance between nucleotides in a single chain. On the other hand if we use your figure for area, obtained I presume from an assumed circular cross section with radius of about 10 Ǻ ,we get for the distance occupied by a nucleotide residue along the fiber axis a value of about 1.12 Ǻ which is only a third of the observed spacing (3.4 Ǻ). For this reason, I take it, you feel that there have to be three nucleotide residues per distance of 3.4 Ǻ along the chain, and therefore construct a model with three intertwined chains. Hence the crux of the matter seems to be to get an accurate estimate of the cross sectional area, as free as possible from assumptions, and that is why I am asking question number 2. 3. Regardless of the mechanism proposed for nucleic acid synthesis, it seems likely that enzymes must be involved. Although this question obviously cannot be answered with any certainty, I wonder whether difficulties will not arise in allowing access of synthetic enzymes to a close packed structure of three interwoven helices such as you propose. The same question might be asked in regard to enzymes of depolymerization which cause rupture of inter-nucleotide linkages and hence must presumably form complexes with groups very close to the phosphate groups. Incidentally, would your structure predict the products of DNA-ase action as well as a single chain or helix? 4. How much change is likely to occur in structure on liberating nucleic acids from the proteins to which they are bound, presumably through purines and pyrimidines, in the natural state? In closing, I might state that I am not trained in advanced physical chemistry or physics, and might therefore not appreciate all of the basis for your model, but I would enjoy hearing from you regarding the questions even if only very briefly. I would also appreciate having any comments which you might have regarding my hypothetical duplicating mechanism, if you feel that this is worthy of comment. P.S. I should appreciate a reprint of your article (referred to in the letter), and any reprints which you might be able to spare on peptide chain structure and hemoglobin chemistry. A.L.D. Letter from Ben May to LP RE: encloses a copy of Science, March 13, thinking that LP might need an extra copy of the article on Bioserological Methods of Human Classification. Letter from C. T. Geiser, Procurement Officer of the U.S. Dept. of Agriculture to LP RE: writes that they have stored in their Bureau space some equipment with Caltech nameplates on them. Asks what they should do with it. [Filed under U: Correspondence 1953] [Letter of response from J. H. Sturdivant to Mr. C. T. Geiser April 1, 1953]. Letter from Peter Pauling to LP and AHP RE: Discusses what he has been doing recently. After the signature, Peter writes, "The professor is ill, but you will get a Crick Watson letter as soon as he has read it. Sid wants his manuscript." [Filed under LP Biographical: Box 5.041, Folder 41.7]. Thank you for the postscript. I have a plane reservation on April 6th at 8:00pm for Paris. When are you going to Bruxelles? My plans are a function of yours. Mamma, I trust you have not done anything about the seats for the chairs. Therefore would you please make patterns of the canvas seats on thin paper & mail me them preferably by air mail as I expect the chairs to be done this weekend? Depend. I shall inquire in to the cost of making a leather seat. Perhaps too expensive. My curtains are wonderful. I am not sure you can see my room. Painters, and a girl will be in it, and the college is closed. 1. You need only send a pattern of half a seat, as they are symetric about the sewn center. I met Wyckof yesterday. He gave a dull talk on the technique of carving & freezing sections. The professor is ill, but you will get a Crick Watson letter as soon as he has read it. Sid wants his manuscript. Letter from Theodore McClintock, W.H. Freeman and Company, to LP RE: Details various aspects of the second edition of General Chemistry that must be edited. Gives twelve numbered corrections to be made. 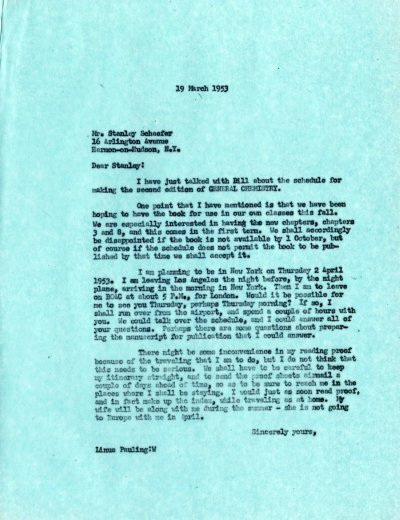 [Reply from LP to McClintock March 23, 1953]. [Filed under LP Books: Box 1953b, Folder 1953b.1].